It’s almost the first week of March 2009, the rain has finally come after almost a 9 week dry spell. The weather extremes have really taken their toll on the garden, with the heat wilting a lot of the tall herbaceous plants, and then the extreme winds pushing them over. 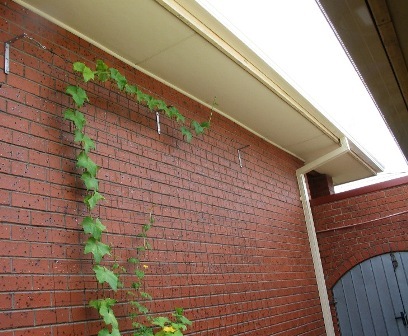 There are still plants that need staking to prop them up, and others need pruning to remove wind damaged branches. It’s created a lot of work, and disrupted the plants at their peak growth time – that’s just nature I guess. 1. 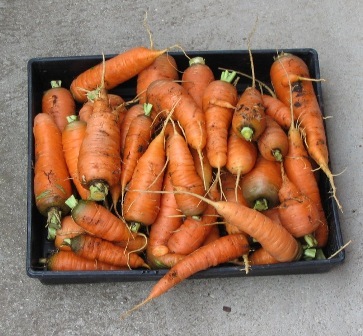 Here’s the carrots that I planted and forgot about! They’ve just been dug up and roughly washed. They are a thick, short variety, and they were planted too densely, but there’s 3.7kg there without any effort. 3. A shot of the garden, all lush and green and soaked with rain. Hopefully there’s a bit more growth left in the garden before he head into the autumn decline. The bright yellow multi-headed sunflowers are prominent in the picture. These are an interesting variety given to me by a friend. They have petals all the way through, even to the centre, but what is amazing is that one plant can produce well over a dozen flowers, sometimes more, and they’re fairly big flowers too. 4. 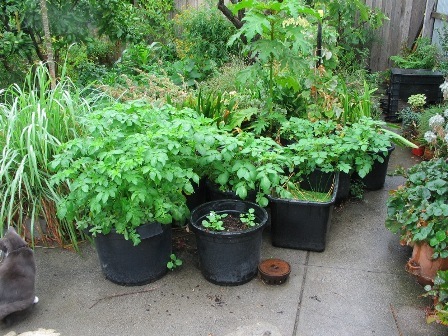 The potatoes in the pots are already thick and lush, and even the new ones are sprouting, and the duckweed has grown to fill the water surface in the water chestnut container. This is a great way to stop algae, plus I can remove the duckweed to feed the goldfish, or use it as a mulch in pots – it’s very nutrient rich. It’s also one of the smallest flowering plants, and has the highest growth rate of the higher plants – in ideal conditions (high levels of nitrates and phosphates), the surface area covered by duckweed can double in less than 2 days. 5. 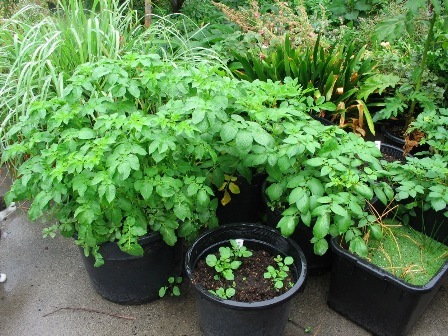 Another angle of the potatoes, they are doing really well, really impressed with the ease of growing them. 6. 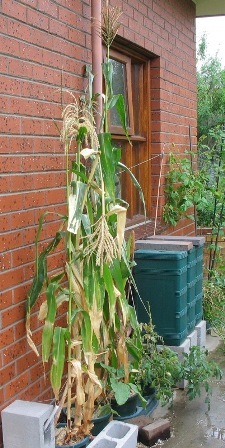 And here’s the hydroponic corn that survived the heat, after the wind had its turn. It’s a pretty sorry sight, hoping it scraped through. Figured you really need to use good supports for hydroponic plants because the perlite which the roots anchor into is so light, the plants get pot heavy and topple over in strong winds. The experiment for next season is to use scoria as the soil substitute to see how that fares. 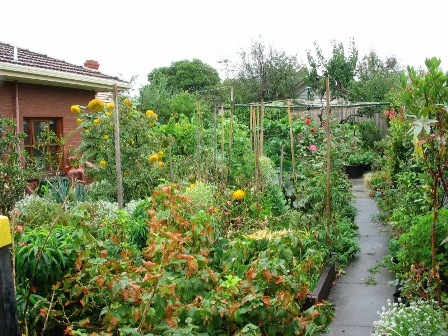 Then I might just fill the pots with a really rich organic mix, and just run straight water, without chemical nutrient, so it will self irrigate, but be 100% organic, like the rest of the garden. There’s plenty more productivity in the garden as everything starts growing once again after the major disruption due to extreme conditions. Let’s hope it regains lost ground quickly! Hi i understand the frustrations of waiting for the weather to break. I live in the south of Thailand and we are in the middle of the dry season, so far nearly 3months without a drop of rain and maybe another month to go. I am trying to start a small permaculture plot. Although several of my crops have been estsblished for a couple of years, at this time of the season they begin to struggle. There is a constant feeling that all the previous effort will go to waste.